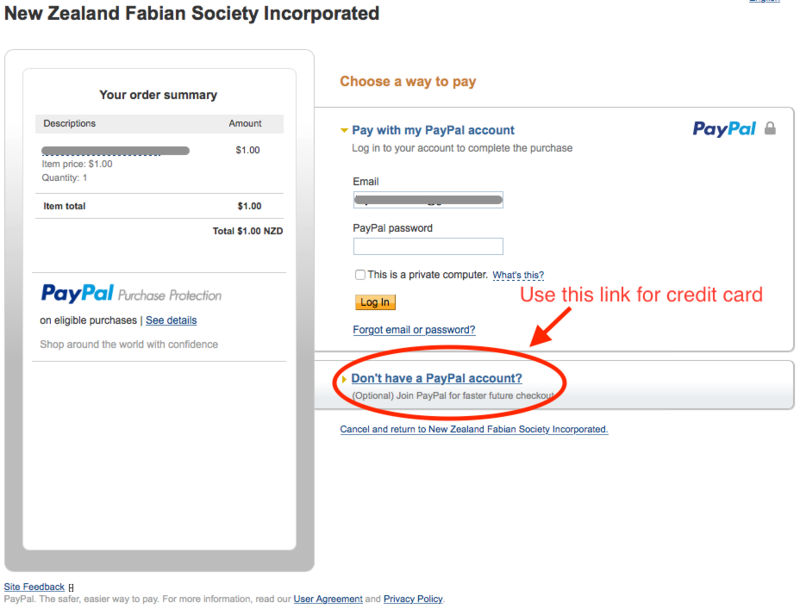 If you have enjoyed NZ Fabian Society activities and can afford a little more than the small annual membership subscription, please consider making a donation or, even better, a regular contribution. Your subscriptions and donations make it possible for us to provide the constant stream of engaging seminars and lectures as we continue to 'incite debate'. Please note that we use PayPal for processing our credit card payments. You don't have to be a Paypal member for this, but sometimes you need to look carefully for the 'credit card' link (see example). Problems? If you cannot see the form below, it is probably because you are using using an outdated browser, e.g. Internet Explorer 6. Please try again using a different browser (IE 7/8+, Firefox, Safari etc. all appear to work without a hitch). Credit Card or Paypal I will make payment by cheque or direct credit. Details available on the next screen.